Have you noticed anything different about the world’s favourite search engine recently? 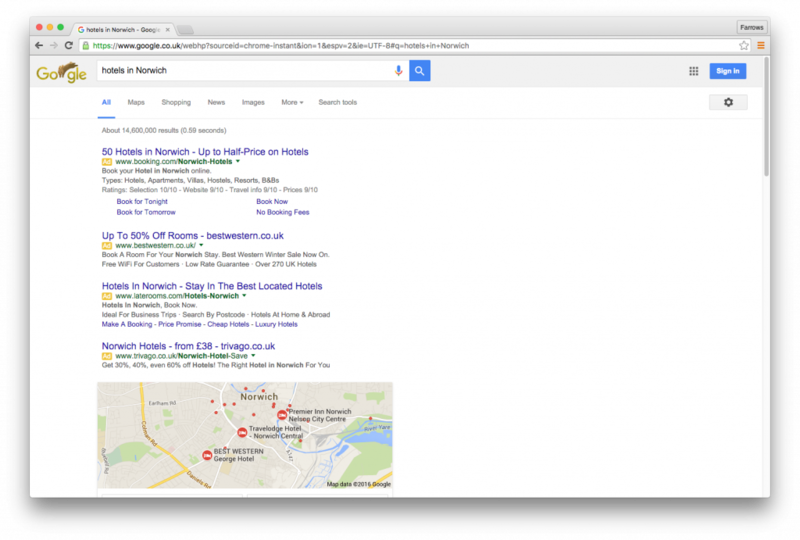 Last week, Google made the decision to remove side ads from their search results page. For a lot of us, Google.com is our portal to the web – just type and go (it even lets you off if you’re feeling particularly lazy at spelling that day). This is even truer if you’re using Google’s internet browser, Chrome; that address bar at the top of the screen taps straight into Google’s search functionality, making it dual purpose for URL site addresses and a freeform online search tool. With over 50 billion sites indexed by its bots, and holding an 80% share of global searches (compared to other search engines), Google is one of the most influential businesses on the web, so it’s always worth paying attention to the decisions they make with their products. Why did they ditch the sidebar? Google is always collecting data from all different kinds of users to see how they interact with its products and adapting its software to its users. When it decides to change something, it usually has a lot of data to back it up – but sometimes it’s just an experiment to see how the users react. No one ever knows for sure exactly why Google does what it does, but it’s fun to come up with some theories. More than half of all Google searches are now made on mobile devices. This means a smaller screen size, where users get stripped back layouts, usually confined to one cascading column of streamlined information.There’s simply no room for a sidebar anymore, and the majority of users just weren’t seeing it. Since then we’ve grown used to certain web page and search result conventions and are a bit less naive in how we navigate the internet. One way we’ve smartened up is to recognise and avoid adverts – especially in sidebars. 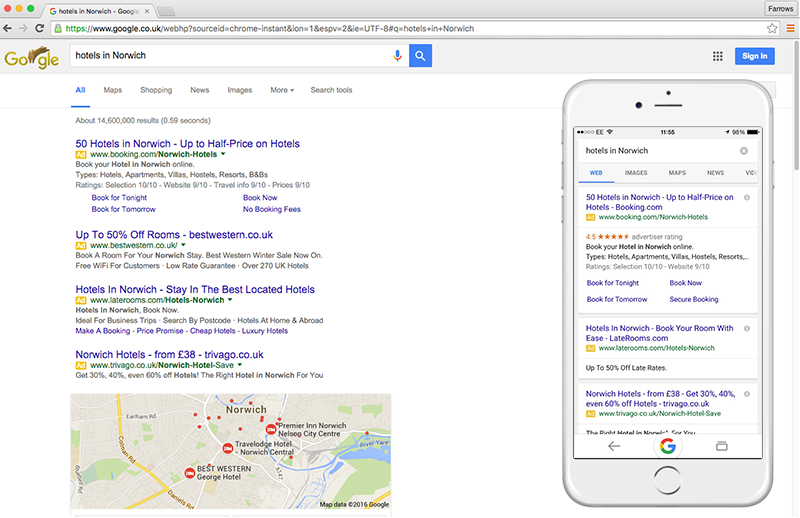 Most users want to feel as though the results they get from a search got there naturally, and feel manipulated when they see an obvious advert. This could have meant that users were inclined to avoid the sidebar and biased against clicking on any ads in that area. In 2000 Google launched AdWords which allows anyone to create a short summary of their business or product, link it up to a few appropriate keywords and then ‘bid’ for their ad to show when users search for that keyword. This has become Google’s largest source of income; in 2014 89% of Google’s revenue came from AdWords, totalling £47.5 billion ($66 billion) in paid advertising. It’s in Google’s best financial interest to make sure that users keep clicking these paid for ads. If they’ve noticed that sidebar results aren’t getting as many clicks then, for the sake of themselves and their clients, they’re going to streamline that traffic into the more clicked-on area. Before, we used to see a mix of sidebar ads and about 2-3 in-search, ‘sponsored’ results at the top of our results list as well as few ads at the end. Now, there are 3-4 sponsored results at the top of the main list, meaning that most users aren’t going to see any organic search results (natural results which aren’t paid for) unless they scroll down the page. It’s not the first time Google has removed its sidebar ads, so we may see them return again. But for the time being, keep an eye on that little yellow ‘Ad’ tag to know which searches are organic, and which ones are paying for your clicks.